This year we would like to make sure our Foodbank Families are given a little extra something to make their Christmas special and we need your help!!! 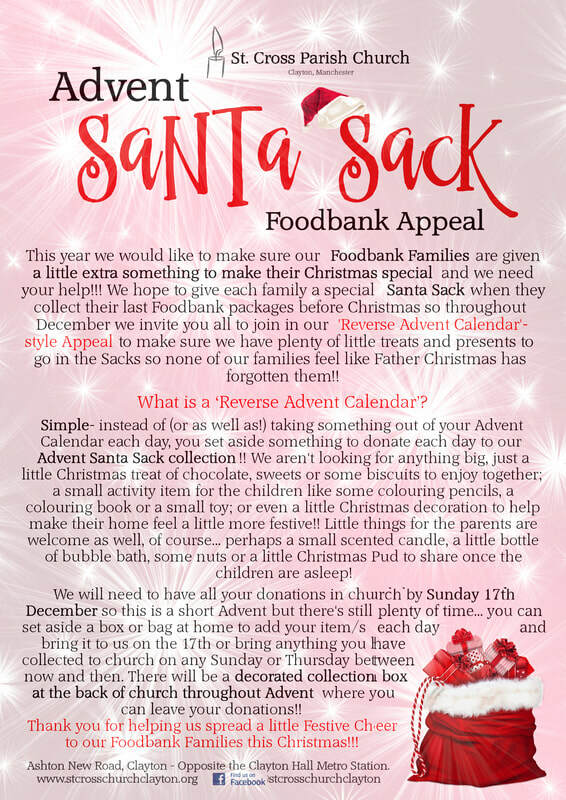 We hope to give each family a special Santa Sack when they collect their last Foodbank packages before Christmas so throughout December we invite you all to join in our 'Reverse Advent Calendar'-style Appeal to make sure we have plenty of little treats and presents to go in the Sacks so none of our families feel like Father Christmas has forgotten them!! What is a 'Reverse Advent Calendar'? Simple- instead of (or as well as!) taking something out of your Advent Calendar each day, you set aside something to donate each day to our Advent Santa Sack collection!! We aren't looking for anything big, just a little Christmas treat of chocolate, sweets or some biscuits to enjoy together; a small activity item for the children like some colouring pencils, a colouring book or a small toy; or even a little Christmas decoration to help make their home feel a little more festive!! Little things for the parents are welcome as well, of course... perhaps a small scented candle, a little bottle of bubble bath, some nuts or a little Christmas Pud to share once the children are asleep! We will need to have all your donations in church by Sunday 17th December so they can be sorted into the Santa Sacks to be given out to our families on Saturday 23rd so this is a short Advent but there's still plenty of time... you can set aside a box or bag in your home to add your item/s to each day and bring it to us on Sunday the 17th, bring anything you have collected to church on any Sunday or Thursday* between now and then. There will be a decorated collection box at the back of church throughout Advent where you can leave your donations!! *After services Sundays 12-1pm and Thursdays 11-11:30am- or during our Foodbank hours on Saturdays between 10:30am-12noon (please speak to one of our Foodbank volunteers on Saturdays as the donation box may not be accessible). Thank you for helping us spread a little Festive Cheer to our Foodbank Families this Christmas!! !